IA, the discipline of creating websites with enhanced usability and findability. Information architecture provides enhanced usability for websites, online applications and mobile apps. It ensures all three supply a better overall experience, where visitors and users can interact effectively, find what they need quickly, and increase their engagement with your product or service. Websites, online application and mobile apps with better organization, structure and attention to their users’ needs, consistently outperform the competition and provide a greater return on investment. Wireframe diagrams are a typical information architecture deliverable. They outline the placement and relationship of key elements in a site or application in much the same way blueprints outline the structure of a building. 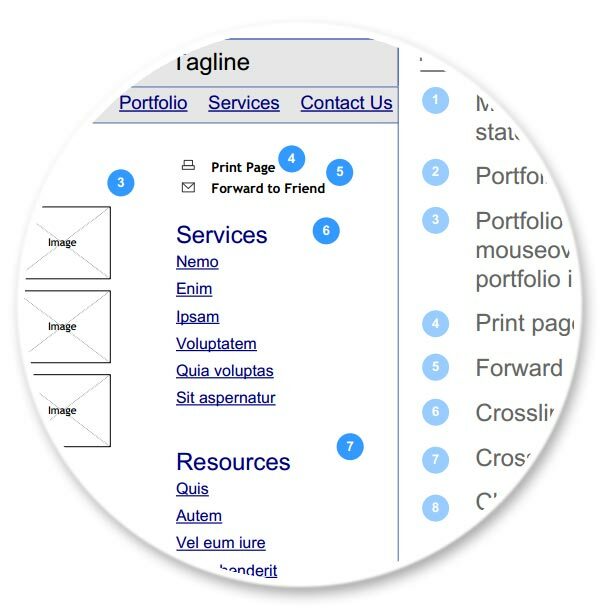 Wireframes provide a means to imagine, discuss and finalize important aspects of your projects before either design or development efforts begin. This planning is important as it help ensure all parties understand not only the goals of the project, but the specific methods they will be achieved. Prototypes are similar to wireframes, but are typically interactive. They exist to help visualize more complex interactions common in web applications and mobile apps. Existing between wireframes and the initial beta version of an application, prototypes allow our team to work out interface issues early in the process. Since wireframing is all about visualizing the structure and functions of a website or application, here’s a partial example deliverable. After all showing is better than telling, right!